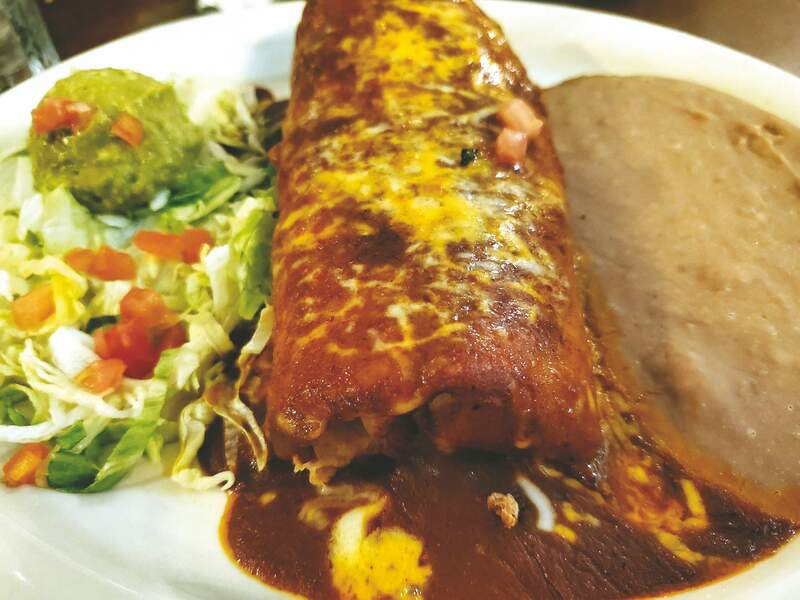 Rubia’s beef chimichanga plate with a side of guacamole and refried beans. For me, this moment happened when my companions and I took an evening trip down over to Aztec to try out Rubia’s Fine Mexican Dining, or Rubio’s, depending on where you’re looking. It was, right off the bat, not what I had expected when we pulled into the restaurant parking lot. I felt like I had stepped into a small corner of bohemian-esque heaven. White Christmas lights were hung on the outdoor patio, and their soft glow was welcoming and comforting. We could hear acoustics from a performer playing for an audience next door at 550 Brewing. The ambiance was exactly what’d you hope for when stepping out for a nice evening meal. The indoor atmosphere was just as inviting. Pictures of cowboys and paintings of nature delicately decorated the walls, and exposed brick peeked out of the plaster, giving the place a warm, vintage feel. Already, there was dozens of patrons seated at tables and the bar. Apparently, this joint is a popular place on a Friday night. 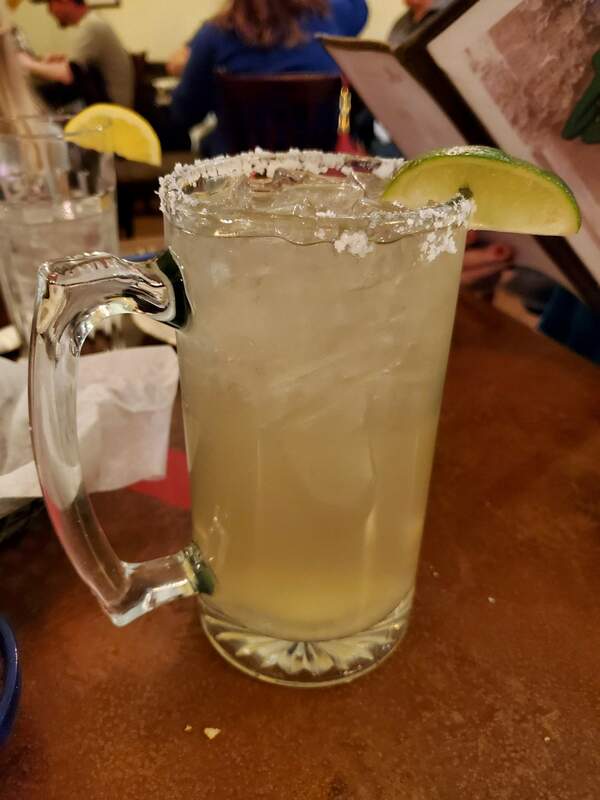 As one cannot go to a Mexican restaurant without ordering margaritas, we did just that, along with some beer, as soon as we took our seats. It was Friday, after all. Rubia’s menu is an unusual amalgam of Mexican cuisine with a smattering of American dinner options, like BLTs, grilled salmon, and club sandwiches. Our group was split half and half as to which side of the menu to order from. 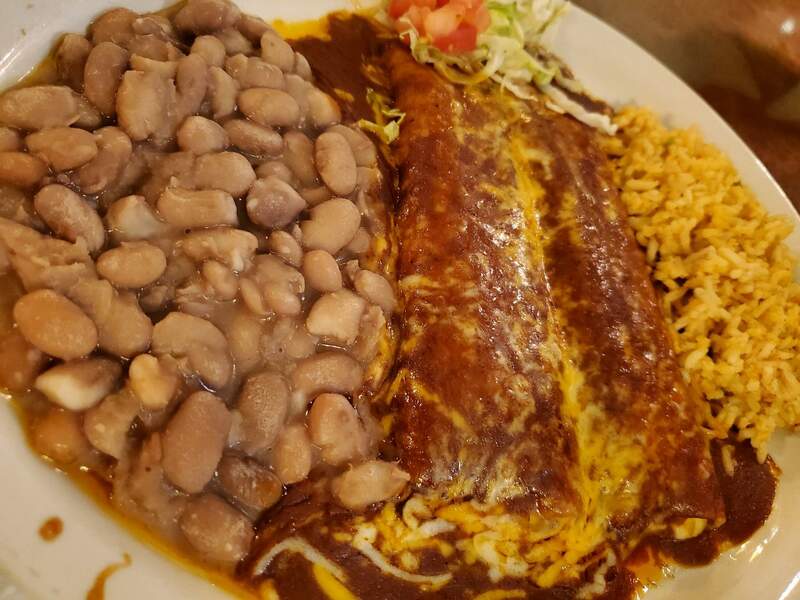 Two of us ordered chicken strips and chicken fried steak, while the other two had come purely for the Mexican food, and ordered cheese enchiladas and a beef chimichanga. We could all agree on ordering one thing, though: a bowl of chili con queso. As I am a cynical robot-human who’s lost any semblance of hope for finding good queso, I didn’t have high expectations. So when Rubia’s queso dip appeared, it brought actual tears to my eyes. Keep in mind, I am probably being overly dramatic, but it’s been so long since I’ve had real, actual queso around these here parts. People seem to think melting shredded cheese on chips is cutting it, and I very much beg to differ. 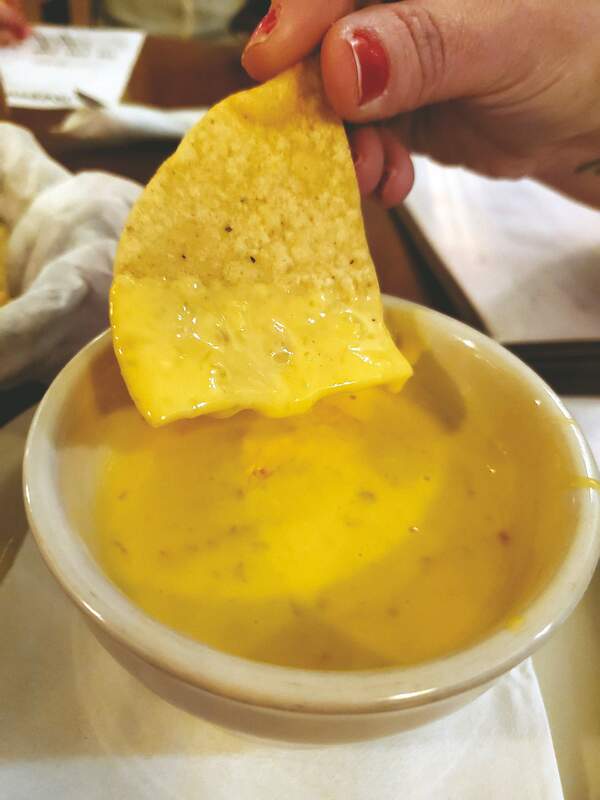 This queso, though, was everything we wanted: thick and creamy, with lots of spicy kick. It wasn’t long before we were slapping each other’s hands away so we could get to the last bits of cheese in the bowl. The rest of dinner was equally as satisfying. The refried beans were smooth and paired satisfyingly with the red sauce and melted cheese on my chimichanga, which was cooked to perfection. The crunch of the tortilla went perfectly with the soft beef and dollop of guacamole I’d ordered, and it wasn’t long before my plate was clean. We were all complaining about how we’d eaten too much when our waitress returned to see if we wanted dessert. Fried cheesecake was an option, so yes. Yes we did. And, it turns out we actually made the best decision of the night by ordering dessert. It was utter perfection. Everyone at the table agreed it was the best fried cheesecake we’d ever had. The balance of the fried crunchy shell paired with the soft, melt-in-your-mouth cheesecake inside made the night at Rubia’s even better. Rubia’s is most certainly worth a trip to Aztec if you don’t live there. 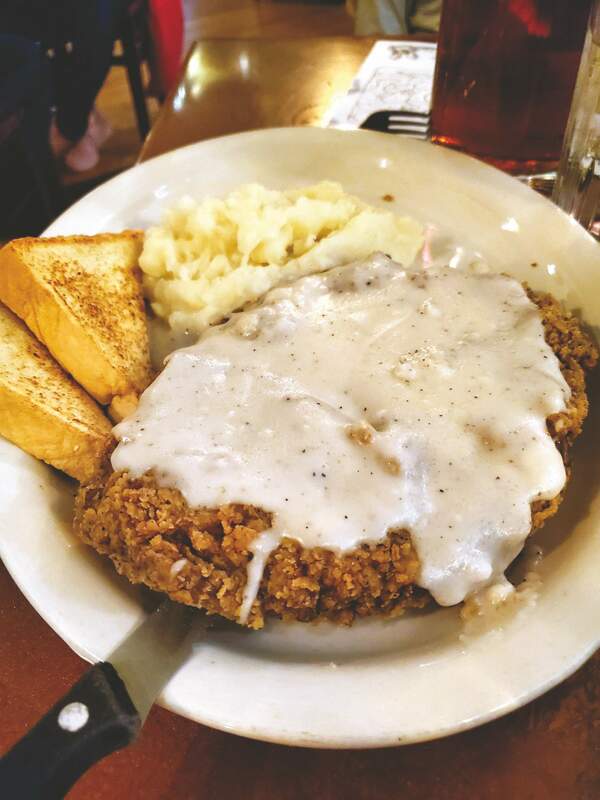 Next time you find yourself road tripping to our neighboring New Mexico town, please take me with you.